No, because Krishna is not just transcendental, existing beyond the world, but also immanent, manifesting within the world. So devoting ourselves to him doesn’t require divorcing ourselves from the world – it essentially requires integrating our worldly actions and aspirations within a life of devotional service to him. Our various goals attain perfection when subordinated to Krishna as our life’s meta-goal, the goal of our goals. 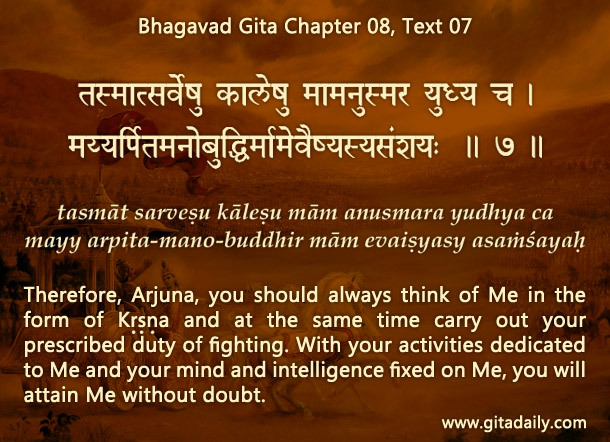 The Bhagavad-gita explains that Krishna manifests as our abilities that enable us to pursue various goals (07.08); as the object to be worshiped by our prescribed duties and the goals therein (18.46); and as the sense of adventure and success in the pursuit of our various goals (10.36). Krishna thus subsumes all of existence, being the Complete Whole. Connecting with him with a devotional service attitude brings wholeness, that is completeness, to our various goals; and it brings wholeness, that is fulfillment, to our heart. Our various goals attain perfection when subordinated to Krishna as our life’s meta-goal, the goal of our goals. Such goals even if achieved can at best give only some fleeting pleasure. But those same goals even if unachieved can propel us towards lasting fulfillment if we pursue them for his pleasure. Why? Because working for his pleasure, even if unsuccessfully in the world’s eyes, enhances our devotion, thereby increasing our inner connection with Krishna, the all-attractive reservoir of all pleasure. The Gita (08.07) assures that blending inner devotional meditation and outer professional occupation will enable us to attain Krishna. When Arjuna made Krishna his life’s supreme goal, he didn’t reject his goal of becoming the world’s best archer – rather he utilized that excellence for furthering his service to Krishna. By similarly spiritualizing our life’s goals, we can progress towards both material achievement and spiritual fulfillment. how do u maintain consistency in ur activities? prabhuji what u do when u feel bored of writing? from two years i m reading gita wisdom u r so consistent prabhu.